Approaching Sacramento, yet another landscape develops. Grassland dotted with a new type of tree that boasts of an umbrella-shaped canopy. Shot past our turn off, couldn’t see the small print “Capitol Freeway”. Stopped at a gas station and called the Hotel for an exit number, turned around and made it! We didn’t want to use G.P.S on phone due to roaming charges. We had stopped at our home phone experts and bought a special package to use while in the States, but as far as we can tell we’ve already maxed out. Data shut off! However our texting option, alive and well, gave us the ability to tease Eric about getting lost and winding up in L.A. Kidding! Found out the Disney tour were just leaving San Jose about the same time we found our hotel. Checked in and were told the Disney crew were arriving between 10:30 and midnight. Went to bed, knowing Eric would probably call when he got in. He did and we woke up around midnight and chatted on the end of the bed with Mariko and our son for about thirty minutes. Next day, Eric, Lloyd and I had breakfast at Cocoa’s, but Mariko stayed in bed and rested. Apparently, full week was had by their cast, with two days of triple shows, plus full day of presentations before that, where skaters performed character parts for principle and understudy roles. We wandered over to a nearby mall, where Eric and Lloyd looked for shoes, and I found a Barnes and Noble where I bought “Home” by Novogratz! Nike grey and fluorescent orange were purchased, size 9 1/2, for Eric’s visits to the gym, then destination “Old Sacramento” thanks to his new iPhone 5 instructions. 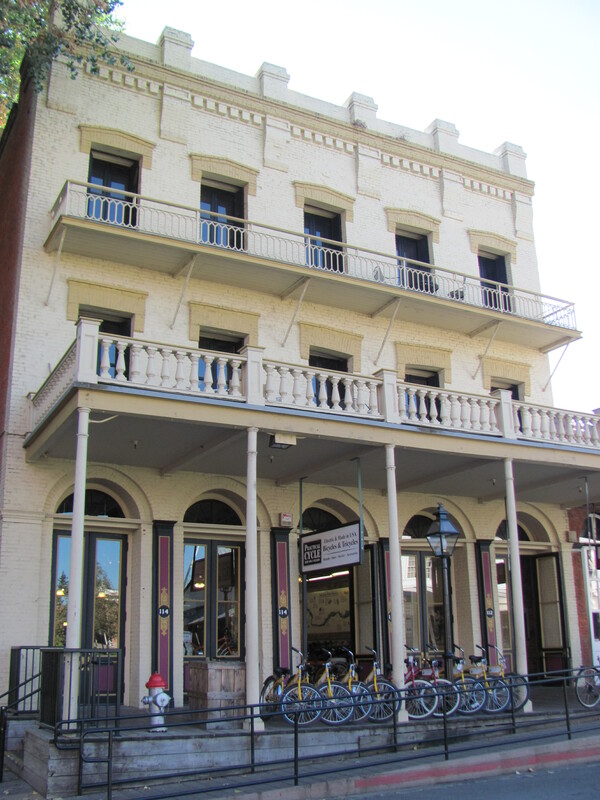 Snapped all kinds of photos in Old Sacramento then returned to Hotel to get ready for dinner and pick Mariko up. 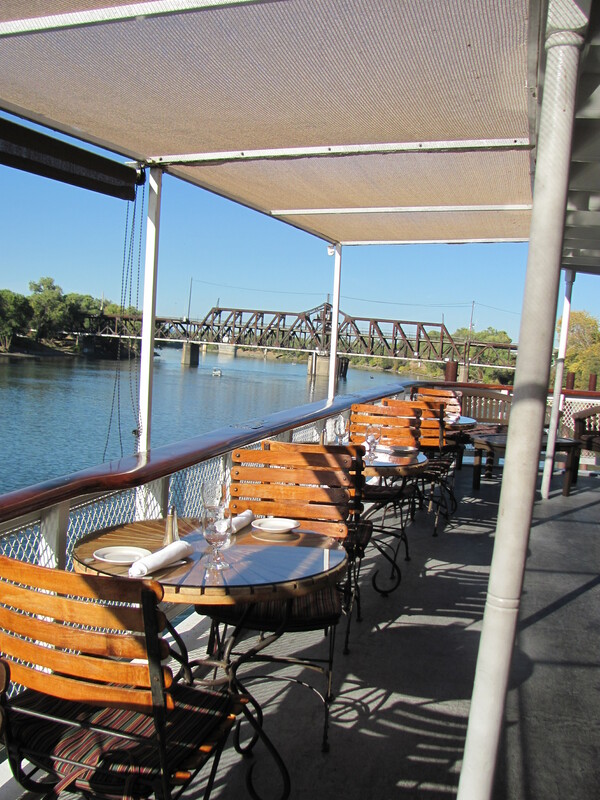 Dinner planned for the Delta King, an old paddle boat on the Sacramento River. Highlights; Meeting up with our son for the first time since August 23rd, face to face! Facetime with Julie, back at work in Olds, Alberta, Facetime with Jordan Lehmann at Wycliffe in Calgary, Alberta while wandering the old boardwalk in Old Sacramento. What a sense of humor! Facetime with Uncle Jack on the Delta King, over dinner. One Hundred and Two Souls on Board. I stood at my studio desk watching a program stream on my computer, noise to keep me company. I assembled three pieces of art in the shape of a totem, and looked up from the table when a movie review caught my ear. A new film with Denzel Washington, called; Flight. I heard just a few words, “one hundred and two souls on board” but that’s all it took for my spirit to identify. That’s right, we are souls. I had almost forgotten what was missing lately, from the daily equation. We are not mere faces on Facebook, objects in magazines, titles on Twitter, widgets on websites. We are SOULS. Our spirits can’t be truly heard over a text. Though we try to convey our feelings through the written word, our emotions, dreams, joy and pain cannot be shared through our devices, they must be lived, audibly spoken, welcomed, trusted, tasted, loved. We’ve learned the art of creation or at least we tell ourselves we have. We’ve engineered miracles of technology and sent man to the moon and we continue to strain to reach beyond, yet cannot reach each other, arms only long enough to pat our own backs and fill our own pockets. We gloat of our accomplishments, persist in our pursuits and forget there is a law of gravity, an ocean, a tide – and now it grows between us. Unforgiving, ticking time, and we race it as if we stand a chance to win. We’ve drunk the serum of deception. Infected with a virus, we are. Discontented and distracted, wined and dined by a visible pulsing power. Now, mostly blind to those who offer their love and who need our love. Now, mostly blind to His redeeming power. Reality eludes us and silence is no more. We’ve been seduced by loud empty promises, that breed more loud empty promises. They scream at us because they are afraid. They’re afraid we’ll find out there’s still hope. But – we can turn them off. If the voice inside your head is driving you away from touch and breath, laughter and passion, from Truth and His purpose – turn it off. You, my friend are a soul, not a number, nor a machine. It is not in the midst of material we find ourselves, but in the midst of relationship. And when we are found we can find others and free them. Extend your hand. Jesus, thank you for patiently waiting by the side of my life’s road. For tirelessly calling my name, until I heard your voice over the noise of empty promises. I turned and saw you with your arms wide open and the cross behind. Your eyes smiled at me and I leapt into your arms. I am a soul that has been saved. I am yours! Pull the Plug and LIVE! It’s hard to believe “typing class” existed in High School, and even more of a stretch – manual typewriters. I smile every time I think of Greg Kinnear from “You’ve Got Mail”, going on and on about the hum of his typewriters, but I think his collection were electric, maybe mixed? At any rate, I’m thrilled we don’t have to type on those “things” anymore, that we have computers instead. But there’s always a danger when technology advances, with each task made easier, mankind has more opportunity to lose themselves. As if we need another distraction! suggest we’ve done just that! Kinnear kept buying and stacking up type writers, so much so, he was beginning to forget the ones he’d already purchased. It was clear he was even more enamored with himself and his words. Today we are inundated with other’s words and what we should collect on the internet, ie; friends on facebook. How many of us actually believe the number of friends on our facebook page truly reflect friendship? And is everyone truly connecting on Twitter because they really care about those they are following, or followed by? How much of these activities are just killing precious time, rather than investing in someone’s life? I’m reminded of a “mirror” story, from the book of James in the Bible, which brings to mind another kind of mirror. The kind millions of people stare into everyday and night, sometimes 24/7 – screens, on their computers or their phones – as if our lives depend on them. James warns us to practice what we’ve been taught in God’s Word, or we will lose ourself! How much of what God teaches us is represented in the activities we choose to take part in, on the internet? What does your life depend on, or have you lost it somewhere? Pull the Plug and LIVE or at least learn to use technology to enrich your life, not ditch your life!